Surgical imaging arms are devices that are highly essential to meet the rising demand for minimally invasive procedures and hence, they have become an important tool in healthcare facilities such as hospitals, clinics, and in research institutes. In terms of revenue, the global surgical imaging arms market was valued at above US$ 1,000 Mn in 2017 and is anticipated to reach approximately US$ 1,600 Mn by 2026, expanding at a CAGR of 4.6% from 2018 to 2026. Rise in the number of interventional radiology procedures, high demand for minimally invasive surgeries, and complication of orthopedic surgeries with traditional equipment are key factors that are anticipated to propel the surgical imaging arms market during the forecast period. Rising globalization leads to the outbreak of several diseases, and some of them require surgery. According to the According to the Annual Plastic Surgery Report by the American Society of Plastic Surgeons, there were almost 15.9 million surgical and minimally-invasive cosmetic procedures performed in the U.S, in 2015, a 2% increase over 2014. This increasing number of surgeries is fueling the demand for more advanced surgical arms. A large number of global manufacturers are emphasizing on the development and manufacture of novel equipment so that the surgeons can carry out the surgical process more effectively and smoothly. Demand for mini C-arms devices is rising due to features such as small size, lower price as compared to other types of C-arms, and easy maneuverability in the operation theater. Key players are focusing on the development of new C-arm devices with better efficacy. For instance, in 2018, Hologic, Inc. launched the Fluoroscan Insight FD Mini C-arm. The system offers a variety of improved imaging features with low-dose rate modes and more flexible transport facility. These key developments are likely to augment the global surgical imaging arms market in the near future. However, high price of surgical imaging arms and technical errors of these devices are likely to restrain the global surgical imaging arms during the forecast period. The global surgical imaging arms market has been segmented based on product, application, end-user, and region. In terms of product, the C-arm surgical imaging devices segment is projected to dominate the market. However, the segment is expected to lose market share during the forecast period, due to fewer opportunities for new entrants in the segment and the availability of more advanced devices in the market, such as the G-arm. In terms of application, the orthopedic segment is projected to expand rapidly at a notable CAGR during the forecast period. Demand for minimally invasive surgeries among orthopedic diseases patients for rapid recovery and high incidence of orthopedic disorders among the increasing geriatric population are fueling the segment. Based on end-user, the hospitals & ambulatory surgical centers segment led the market, in terms of revenue, in 2017. It is anticipated to maintain its dominance of the market during the forecast period. In terms of region, North America held a major share of the global surgical imaging arms market in 2017. Robust healthcare infrastructure and rise in number of surgeries are propelling the market in North America. In terms of revenue, the market in Asia Pacific is projected to expand at a rapid pace during the forecast period, due to a rise in the number of surgeries in such a huge population. Rise in hospitals in countries such as Saudi Arabia and Qatar, and increase in government investment in the healthcare system in countries such as Colombia, Mexico, and South Africa are likely to boost the market in Latin America and Middle East & Africa. Key companies operating in the global surgical imaging arms market that are profiled in the report include GE Healthcare, Medtronic, Koninklijke Philips N.V., Canon Medical Systems Corporation, Siemens Healthineers AG, Shimadzu Corporation, Whale Imaging Inc., Hologic, Inc., and ATON GmbH. These players are adopting organic and inorganic growth strategies to expand their product offerings, strengthen their geographical reach, increase customer base, and gain market share. For instance, in May 2015, Ziehm Imaging Inc. a Germany-based company, acquired Ortho Scan Inc., a U.S.-based mini C-arm manufacturer to expand its C-arms product portfolio and geographic presence. Surgical imaging arms is a vital component in the field of surgery, especially to perform minimally invasive procedures. The global surgical imaging arms market is expanding at a significant pace due to a rise in the number of surgeries and an increase in the demand for minimally invasive surgery. The global surgical imaging arms market report comprises an elaborate executive summary, which includes a snapshot that provides information about various segments of the market. It also provides information and data analysis of the global market with respect to the segments based on product, application, end-user and region. A detailed qualitative analysis of drivers, restraints, and opportunities has been provided in the market overview section. Additionally, the section comprises a competitive matrix and company profiles to understand the competitive landscape in the market. This section of the report also provides market attractiveness analysis by geography and market share analysis by key players, thereby presenting a thorough analysis of the overall competitive scenario in the global surgical imaging arms market. In terms of product, the global surgical imaging arms market has been segmented into C-arm surgical imaging devices, O-arm surgical imaging devices, G-arm surgical imaging devices. The C-arm surgical imaging devices segment has been further split into fixed c-arm, mini c-arm, and compact c-arm. In terms of application, the global surgical imaging arms market has been classified into orthopedic, cardiovascular, pain management, urology, and others. In terms of end-user, the market has been segregated into hospitals & ambulatory surgical centers, academic & research institutes, and others. The product type segments have been analyzed based on different type of surgical arms used for surgical purpose. The market size and forecast for each of these segments have been provided for the period from 2016 to 2026, along with their respective CAGRs for the forecast period from 2018 to 2026, considering 2017 as the base year. 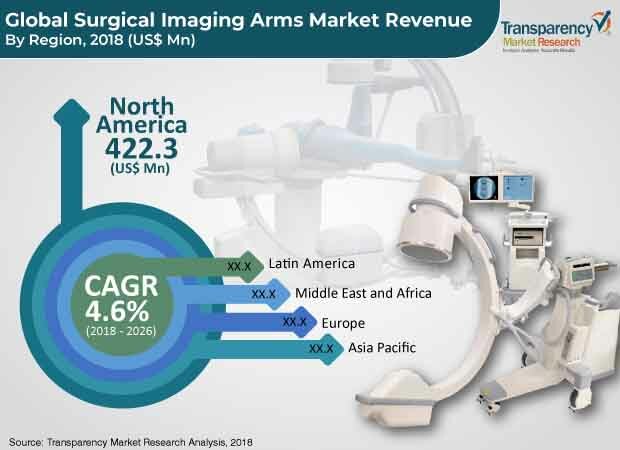 In terms of region, the global surgical imaging arms market has been segmented into five major regions and key countries/sub-regions in the respective region: North America (the U.S. and Canada), Europe (the U.K., Germany, France, Italy, Spain, and Rest of Europe), Asia Pacific (China, Japan, India, Australia & New Zealand, and Rest of Asia Pacific), Latin America (Brazil, Mexico and Rest of Latin America), and Middle East & Africa (GCC Countries, South Africa, and Rest of Middle East & Africa). The market size and forecast for each of these regions and the mentioned countries have been provided for the period from 2016 to 2026, along with their respective CAGRs for the period from 2018 to 2026, considering 2017 as the base year. The research study also provides the competitive scenario in these regions. The report also profiles major players in the market in terms of various attributes such as company overview, financial overview, devices portfolios, business strategies, and recent developments. Major companies profiled in the global surgical imaging arms market include GE Healthcare, Medtronic, Koninklijke Philips N.V., Canon Medical Systems Corporation, Siemens Healthineers AG, Shimadzu Corporation, Whale Imaging Inc., Hologic, Inc., and ATON GmbH.